These fried artichokes are especially pretty because they are pressed so that their leaves open up and resemble flowers. The leaves are crispy like chips and the hearts are meltingly soft. Either regular artichokes or baby artichokes can be used. Regular sized artichokes have a nice big heart and big leaves. Baby artichokes are cute; they have a very small heart so they will be mostly crispy leaves but are faster to prepare since they don’t have a choke. Since there is no batter, these are very simple and easy to fry. The frying is done in two steps–the first frying is at a low heat to cook the artichokes through, and the second frying is done quickly at a high heat to brown and crisp them. Source: “Carciofi alla Giudia — Crisp-Fried Whole Artichokes” from “Essentials of Classic Italian Cooking” by Marcella Hazan. Marcella Hazan’s recipe is written for whole artichokes; for baby artichokes, I used the timing for baby artichokes from “Baby Artichokes, Jewish Style” from “Vegetable Love” by Barbara Kafka. 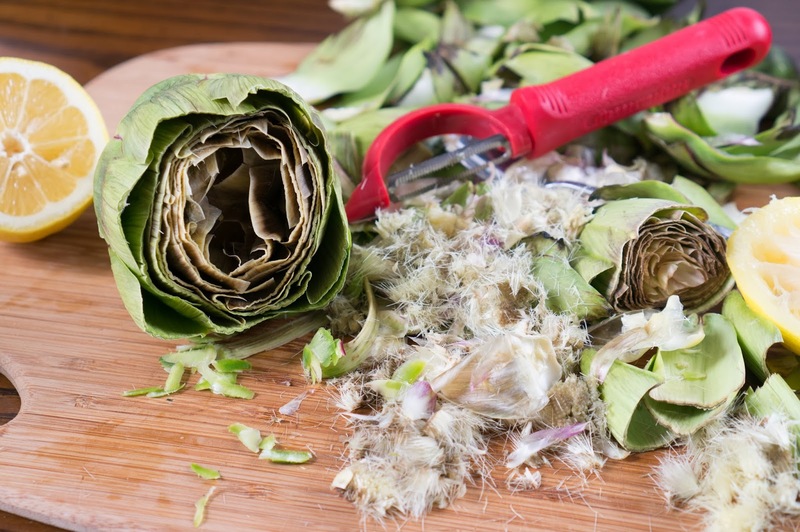 Trim the artichokes by snapping off their brittle leaves until you uncover the tender leaves which are half yellow and half green. Slice off the fibrous green tips, and then use a paring knife to shave off the fibrous portions at the base of the snapped off portions and on the stem. The green parts of the stem should be shaved off (the green outer parts of the stem has tough strands, the inner white part of the stem is tasty and edible. As you clean the artichokes, rub the cut parts with a lemon half to help prevent them from turning black. See here for more detailed information on how to trim baby artichokes. Regular artichokes are trimmed similarly, except that the choke needs to be removed and the inner purple leaves with a thorn on top should be plucked out. It is easiest to remove the choke and inner purple leaves after the artichokes after the first frying stage has softened them — this is the method suggested in the recipe. If the artichokes are very fresh, it is also possible (although it takes more work) to remove the choke when the artichokes are raw, by pressing open the leaves until the choke is revealed and then using a spoon to scrape out the choke. 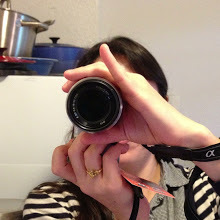 Heat the oil to 250 F in a large heavy pot with tall sides (e.g. cast iron dutch oven). Add a several artichokes (you can add however many fits as long as there is some space between them and the temperature doesn’t drop too much, but you shouldn’t overcrowd the pan). Cook for about 5 minutes for baby artichokes or about 15 minutes for regular artichokes (or until they can easily be pierced with a knife; they shouldn’t get browned yet), turning occasionally (if your baby artichokes are bottom heavy so they would only float right-side up in the oil, you can gently hold them down in the oil for a few seconds with a slotted spoon or frying spider to help the tops cook through instead of turning them). Remove from oil with a slotted spoon or frying spider. Let the oil drain back into the pot and then place on a drying rack. Repeat with all the remaining artichokes. The artichokes are very hot when they come out of the oil. Let them rest for several minutes, until they are cool enough to handle. If using regular (non-baby) artichokes: Gently spread their leaves apart until you can see the inner purple leaves; try not to detach any of the green leaves from the artichoke. Pluck out the inner purple leaves and discard them. Use a spoon to scrap out the choke; discard the choke. Gently open their leaves even more and press their tops on a cutting board to press them flat. Press them gently but firmly (using your fingers, a spatula, or spoon), since their delicate inner leaves will tend to fall out if they are pressed very forcefully. Salt and pepper them. The artichokes can be prepared to this point up to a few hours ahead of time. Add several artichokes to the pot (you can add however many fits as long as there is some space between them and the temperature doesn’t drop too much, but you shouldn’t overcrowd the pan) and fry for 30 seconds for baby artichokes or a couple minutes for regular artichokes until they are browned and crispy. Fry them until they are golden brown and the leaves have no (or almost no) green on them. If the leaves are green or yellow, then the leaf will be too tough to eat whole and they won’t be fully crispy. Remove the artichokes from the oil; hold them upside down over the oil for a few seconds until most of the oil drains off of them. Place them upside down on a rack to let the oil drain. Salt them on the top and bottom sides. Repeat with the remaining artichokes. Serve immediately while they are still hot, preferably on a plate lined with some paper to absorb the oil (you can use a cut out piece of brown paper bag). Optionally squeeze lemon juice over, or serve with lemon slices to squeeze over and dipping sauces (such as a flavored aioli, ranch dressing, or Sriracha mayonnaise), and garnished with fried herbs (recipe below). 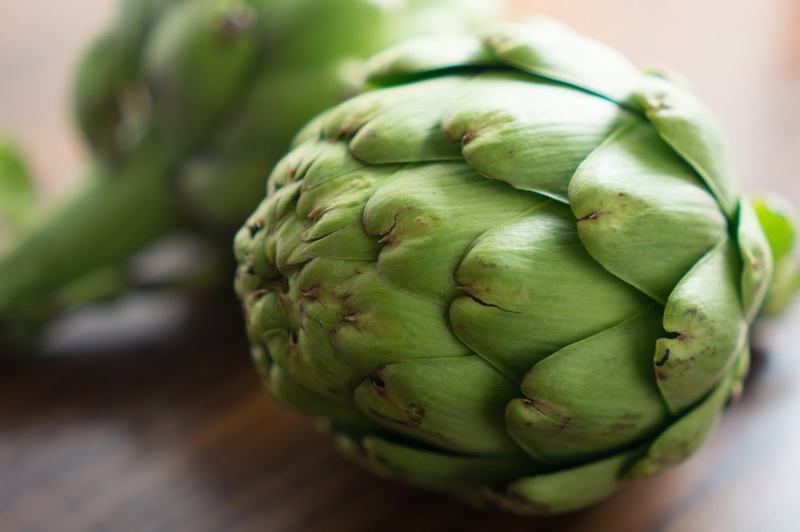 Note: It is also possible to remove the choke while the artichokes are raw, but it is much harder than removing them after they are softened by cooking. Very fresh pliable artichokes must be used, so that their leaves can be pressed open and so the heart is tender enough to scrape the choke out. Gently spread the leaves of the trimmed raw artichokes as far apart as you can without breaking them. Pluck out the inner purple leaves and discard. Use a round tipped knife, such as a butter knife to scrape out the choke. This works best with very fresh artichokes, since they are more pliable and less brittle. I like to use fried herbs as a garnish for this dish. They add even more crispiness to the dish and are easy to make since you’ll already have the oil heated to 350 F. You can fry almost any herbs, however, you should only fry a small handful of leaves at a time, since leaves contain water inside of them. Capers can also be fried; first soak them in some water until they are less salty, drain and then lay them on a paper towel to dry them well. Fry them similarly to the herbs; they will take about 30 seconds to fry (fry them until most of the bubbling goes down). Capers are unopened blossoms — if you are lucky, when they are fried some may open up and look like pretty little flowers. Make sure that your herbs are very dry (do not wash); any water on the leaves will cause the hot oil to violently splatter. Pick leaves off them stems until you have about 2 cupfuls. Heat several inches of oil to about 350 F in a large pot with several inches of space for the oil to bubble up and increase in volume. Place a rack or plate lined with paper towels near your frying pot. Fried herbs have a tendency to be oily; the spreading them out on paper towels helps to absorb some of the oil. Start with just one small half handful of leaves, and use this first batch of leaves to test the moisture content in the leaves. Stand an arm’s length away from the oil and use a long-handled spider or mesh strainer to over turn the leaves into the oil so that your hands aren’t above the oil. Since they are light you can drop them into the oil from several inches above and they won’t splash. Quickly stand back away from the oil; the moisture inside the leaves will cause the oil to immediately bubble up, steam, and possibly splatter until the water evaporates. If you fry too many leaves at one time, the water in the leaves can cause the oil to violently steam and splatter–if this happens greatly reduce the amount of leaves that you add. As soon as the bubbling subsides (it should take only a few seconds for basil, sage needs a little longer) remove the leaves with a slotted spoon or spider. The quicker that you remove the herbs, the more vibrant green it will be. Let the excess oil drain back into the pot and then place the herbs on a paper towels set over a rack. The leaves should be very crispy, dark green, and have a mild taste. If they are dull green or brown then they were cooked too long or at too high a temperature. If the moisture content of your leaves is low and they don’t bubble up much or splatter, you can increase the amount of leaves up to a couple handfuls that you fry in each batch. If you are comfortable, you it is okay to use your hands drop herbs into the oil, as long as you quickly remove your hands away. Repeat until you have fried as much herbs as you’d like. Regulate the oil temperature to maintain a constant temperature. Sprinkle a pinch of salt over the crispy herbs. * The sauce in the picture with the whole fried artichokes is Sriracha mayonnaise. I sometimes use this as the dipping sauce since it is quick and easy to make and I often I have the necessary ingredients in my refrigerator–Sriracha and mayonnaise, which I mix in approximately equal proportions. Either Japanese Kewpie mayonnaise or American style mayonnaise can be used. To make, see the recipe here. It is also possible to make your own Sriracha mayonnaise from scratch.